nitekillerz had the most liked content! Hey guys so I'm having huge issues mounting the alternator to my engine. Ive tried over 4 options to mount it. at first i tried using alternator only brackets but none fit. then i gave up and went to use the stock Camaro acc bracket. i gutted the ps pump to use it as a pulley. now i ordered a doorman ac delete pulley but it is way too big and hits the frame rail. at this point I've had no other luck thinking of ways to mount it. really frustrated with this. I've looked it up and haven't found anything that works. Looking for the complete package or parts of it for my 260z. 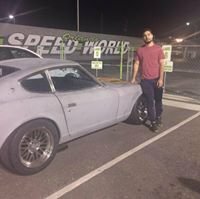 I have a 260z thats wiring wise all stock. My fuel, clock and tach(sometimes) gauges all work. My voltage is stuck somewhere in negative so I'm not sure if thats electrical issues involving alternator but i don't mind that one not working. My oil and water gauge does not work. I have a newly bought oil sender, the bullet type water temp sender(is this the sender) with single bullet connector connected but the sensor next to it with two wires coming out isn't connected because they were cut completely off. I took off gauge and put battery + terminal to ign(G) and the black wire to ground. i then grounded my oil wire(Y/B) and it only moves to the 0 position. i thought it was supposed to move all the way? Is the gauge bad? Any help is appreciated as i really can't afford one right now and don't want to run my car without either of these gauges. Also how can i tell if my water pump is working? I have no leaks but i feel the engine gets very hot very quickly. I took the radiator cap off and i thought bubbles would come out or you would see the coolant flowing or moving but it was very still. I'm afraid thats also bad. thank you for this, very useful. one quick newbie question. how do adjust the dizzy itself? yes there is a return spring on the pedal. Hey guys i recently got my 260z running but have only been able to move forward and back a couple inches(i put it under a tree and then was blocked by other cars lol). What i have felt compared to my 2009 car is that the clutch pedal comes back very slowly instead on almost instantly like my newer car. I am not sure if its just an old car thing because i drove my friends MK3 supra and it did the same or just both our cars have problems. I have replaced master and slave cylinder and bled the system. My major concern is ill feel like when I'm speeding that ill be eating half my clutch while changing gears rapidly. So I would set the timing advance on the dizzy? How much should it be and how do I limit from going too much and detonating? I bought my 260z with triples installed. I was able to get the engine to fire it up but only iddle. My question is, with this setup will the standard distributor left stock will vacuum connected work? I've heard triples need advanced timing in mid teens but if you do with vacuum it'll run in 40s at WOT and could detonate. Below is a picture if my distributor. How do I know if it was modified already? And I thought early 260z had turn signals that were on grill and quarter panels?